FORT WAYNE, Ind. 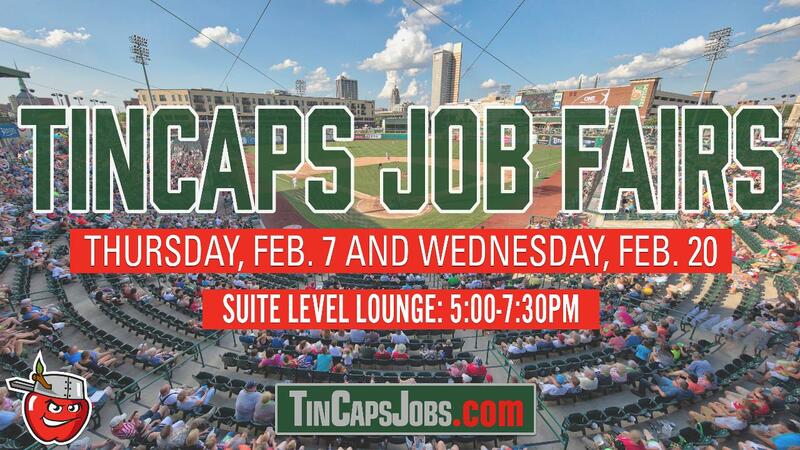 - The Fort Wayne TinCaps are hosting a Job Fair at Parkview Field on Thursday, Feb. 7 (5-7:30 p.m.) and Wednesday, Feb. 20 (5-7:30 p.m.) in search of seasonal employees for the 2019 baseball season. Each year the TinCaps hire approximately 600 part-time workers to serve in a variety of roles around Parkview Field, which has been ranked the No. 1 Ballpark Experience in Minor League Baseball six of the past eight years. Note: Those who have already submitted a 2019 application with the TinCaps don't need to attend. Those who cannot make the Job Fair are still welcome to apply online at TinCapsJobs.com or by completing an application and dropping it off at Parkview Field's Administrative Office during business hours. Candidates must meet age requirements and pass a background check. The TinCaps, a proud equal opportunity employer, are flexible with employee schedules. Questions can be directed to TinCaps Office Manager/HR Administrator Cathy Tinney (260-482-6400, tinney@tincaps.com). Opening Night for Parkview Field's 11th season is set for Thursday, April 4 (7:05 p.m.) when the TinCaps host the Lansing Lugnuts (Toronto Blue Jays). The regular season runs through Labor Day (Monday, Sept. 2). The complete 2019 TinCaps schedule and promotions calendar can be found at TinCaps.com. Tickets for all games go on sale Wednesday, Feb. 13 at 8 a.m.